As I C It, I have a view of a beautiful, snowy mountainside on the outskirts of Gallup, NM alongside I-40. Mind you, mother, daddy and I were coming from a stay in Eastern New Mexico and heading back to Arizona & Nevada from our visit for the funeral of a family friend. We finally arrived into Gallup sometime between 1:30 a.m. and 2:00 a.m. Today is Monday, February 22, 2010. In a rush Sunday evening after reading the weather advisory in effect until Tuesday and not wanting to be snowed in at the farm with limited supplies we left Pleasant Hill, NM and begun our journey west. By the time we reached Albuquerque I was in doubt that a winter wonderland was on its way. I peered frequently at the weather channel on my Blackberry and it would never waiver in the fact that by 10:00 p.m. there would be snow (in every city that we had already passed and were heading to) however no snow did I spy. After a quick stop in Albuquerque for gas and break, we headed on down the road toward our stopping point for this leg of our journey - Gallup. I slumbered some after leaving Albuquerque and was jolted awake by Daddy as he was maneuvering through the wet, slick snowy roadway that had become a one-lane street rather than a freeway. Truckers were everywhere as well as a few others who wanted to live dangerously and flew by in the left 'fast' lane that was quickly becoming a white blanket. I had just missed the overturned double tractor-trailer, which I assume is the conversation that mother and daddy were having when I was startled awake. Thirty miles took forever to track and the snow appeared to be a white out blizzard at times. I must tell that I do not enjoy driving in the snow because of the accident I had during the winter of 1988 so I was quite happy it was daddy at the wheel of the car rather than me. I will digress momentarily to tell you that back in 1988 when traveling down the highway in Amarillo between the airport and town, I had the unfortunate opportunity to have an 18-wheeler zoom past me, startle me and in a split second, without thought, I tapped the brakes on the car. Not the best decision in my then 20 some odd years of life because the winter wonderland upon which I was driving was really a black icy roadway. The 20-year-old mother in me had a lifetime of memories flashing through my mind and the worry for my 13-month-old son who was sitting in the rear seat. You see the child seat he was in was one that set up high so he could see the world about him and in an instant my thought was oh dear Lord please don’t let the trailer decapitate my son. By the grace of God, I was driving a car with a front end that was short enough that it only tapped-off the mid-set of tires on the tractor’s trailer. I bounced off the tires and then proceeded to spin 180 degrees ending up on the shoulder heading in the opposite direction of traffic but not in the lane of traffic. God is good. He spared my life, my son’s life and my friend’s life. Had the front end of the car been of any other length I know that we would have gone under the trailer and spun out of control from the force of the trucker’s wheels and not live to praise God for his grace and mercy. Well we made it past this blizzard of white beauty and I now sit in my hotel room. I love the view that I have and the snow that is either blowing or falling from the sky. Mom called my room this morning to say we ‘d stay another night instead of trying to make it on down the road. With the gym, Internet, a book, several newspapers and magazines I am set for the day to keep myself busy. On another note, I want to say that Don Teague’s funeral was uplifting. Pleasant Hill Baptist Church overflowed with friends, loved ones and community residents who all had one thing in common…their love of Don and his faithfulness and friendship. I will miss Don. He and his wife Dona were instrumental in assisting my parents and grandparents with the teaching of life, values and of my blessed Redeemer and Saviour during the period of time we call middle school. They let me begin to tag along with the youth group (they were the youth leaders at the time for PHBC) every time I was out at Meemaw and Papa’s. This was about the time I began 6th grade and until we moved to Roswell. I am so thankful that I had the opportunity to know the Teague family. I have stored up indelible treasures in the memory bank of my life of activities and trips and camping that will forever be a part of me. I must thank you Don and Dona for a rich legacy that you have left for many generations to carry forward to future generations. Each of the Teague sons spoke at the funeral. Lance was just down to earth and to paraphrase him as being just an ole’ plow-boy as he spoke favorably of how his father sought to encourage his sons in their passions and dreams yet keep them grounded in the Word and the Lord. Mark had three points to his father’s life but its rich root again was to stay grounded in the Word and that the Word is the way to live and pursue life. I did not know Mark was such a great public speaker…he almost appeared pastoral in his “sermon”. Mike…you are witty and talented. I love your piano skills. They inspire me to learn to play the piano, to have the piano tuned and pick up lessons and continue from what I do know. I am thankful you were able to play for your father and your duet with the violinist was a pure joy. This funeral was to me joyous. To me, and I do not say this with any disrespect but with great admiration, this was a Sending Off To Heaven party for one of God’s faithful servants. Saturday afternoon we went back out to the farm and then over to visit with the Holdeman's. I love that family. They are such gentle people and so thoughtful and kind. On Saturday night we had the great privilege of visiting Dona, each of her boys, their wives and other family members as well as a former pastor of PHBC. We enjoyed dinner with them and had a great time visiting and regaling of the past. It was quite joyous. Sunday my brother Charles, his wife Julie and my nieces Tessa and Emilee came to the farm. My aunt Nessie and Uncle Larry came down as well and all of us went into Clovis to Leal’s for lunch. It was a great time of family. I have enjoyed every bit of my time in New Mexico. I miss my home state. I am excited that I was able to take time to walk around the land surrounding the house and the barn and the old buildings around the farm. I will post pictures of the farm, what I call “home”, when I get back to Las Vegas and can download them from my camera. 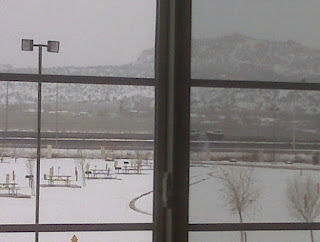 Today I will share the pretty yet snowy view taken with my Blackberry from my hotel window in Gallup, NM. Until we meet again…may God bless and keep you.